Prime Minister Lee Hsien Loong has announced the biggest shake-up of his Cabinet in recent years, involving all ministries but one. The fourth-generation ministers will come to the fore, with two-thirds of ministries - 10 of the 16 - to be helmed by them. This is up from eight previously. Three veterans with a collective experience of 66 years on the front bench will retire from the Cabinet: Minister for Trade and Industry (Trade) Lim Hng Kiang, 64; Minister for Manpower Lim Swee Say, 63; and Minister for Communications and Information Yaacob Ibrahim, 62. Their successors are, respectively, labour chief Chan Chun Sing, 48; Second Manpower Minister Josephine Teo, 49; and Minister for Trade and Industry (Industry) S. Iswaran, 55. The change of guard at these ministries, which takes effect next Tuesday, underscores what PM Lee described as a leadership transition that is "well under way". He noted in a Facebook post yesterday that this year's reshuffle - the third since the 2015 General Election - is more extensive than usual. Giving some insight into his thinking behind the changes, he said he decided to stretch the younger leaders, giving many of them two ministries and additional responsibilities. "The younger ministers will progressively take over more responsibility for governing Singapore." Among them are Ms Indranee Rajah, 55, the only one to be promoted to full minister. The Senior Minister of State will be appointed Minister in the Prime Minister's Office (PMO) and be Second Minister for Finance and Education. This means there will be three women in the Cabinet, along with Culture, Community and Youth Minister Grace Fu, 54, and Mrs Teo. Meanwhile, Education Minister (Higher Education and Skills) Ong Ye Kung, 48, gets an expanded role at the ministry, taking charge of the entire swathe of education policies. He relinquishes his role as Second Defence Minister. Fellow Education Minister (Schools) Ng Chee Meng, 49, will be appointed Minister in the PMO, following an announcement on Monday that he will move to the labour movement, where he is expected to eventually take over as the National Trades Union Congress' secretary-general. Overall, the new Cabinet will be a somewhat more youthful one. Its average age will be 55, down from 56 currently. It will also be slightly trimmer, with 19 members, down from 21. The last major Cabinet change was after the May 2011 General Election, in which the People's Action Party received its lowest vote share since independence. In what PM Lee then called a "radical change" so as to have a fresh start, 11 of 14 ministries saw new leaders in charge. This time, the focus is squarely on leadership succession. PM Lee previously said there must be a new team ready to take over from him "soon after the end of this term", which ends in January 2021. The next general election must be called by April that year. In line with that, key 4G leaders are being given additional duties. Finance Minister Heng Swee Keat, 57, will set the national agenda for research and development, taking over from Deputy Prime Minister Teo Chee Hean, 63. Mr Chan will oversee the public service, another of DPM Teo's responsibilities. The new Minister-in-charge of Muslim Affairs will be Mr Masagos Zulkifli, 55, while Dr Janil Puthucheary, 45, will assume responsibility for cyber-security matters. Dr Yaacob, who currently oversees both tasks, will relinquish them when he retires from the Cabinet. Four backbenchers are also being brought in to government roles. Mr Edwin Tong will be Senior Minister of State for Law and Health from July 1, and Mr Zaqy Mohamad will be Minister of State for National Development and Manpower. There will be two new Senior Parliamentary Secretaries: Ms Sun Xueling and Dr Tan Wu Meng. Yesterday's reshuffle came amid the looming question of who will be Singapore's next prime minister. Mr Heng, Mr Ong and Mr Chan are viewed as the three front runners. Observers were mixed in their assessment, as they read the tea leaves. Some suggested that Mr Chan appears to have pulled ahead of the pack, given that he is now given a new role at the Ministry of Trade and Industry, rounding out his exposure to different portfolios. But others said it is too early to tell. Said Nominated MP Ganesh Rajaram: "Next year or so, people will be looking to see how the three fare in these roles. And then we can see who might be the front runner." From May 1, the fourth generation ministers will have a dominant presence in the Cabinet, at least based on numbers. They will make up nearly two-thirds of the nation's top executive body, up from around half now. Of the 16 ministries, 10 will be helmed by a 4G minister. This change is more than a statistic. It marks a new phase in the changing of the guard. Ministers born in the 1950s are gradually handing over power, portfolios and prominence to those born in the 1960s and 1970s. The process, which began in earnest in 2011, will eventually see the 4G ministers fully responsible for Singapore and the lives of all its 3.4 million citizens. 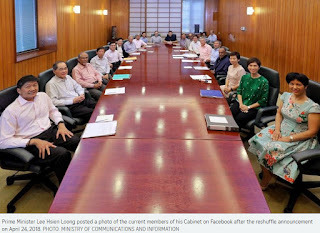 "The leadership transition taking place in the next few years is well under way," said Prime Minister Lee Hsien Loong yesterday after the Cabinet changes were announced. As part of the ramp-up towards the handover, the reshuffle stretches the younger ministers. Some are staying put but assuming added responsibilities. Finance Minister Heng Swee Keat takes charge of National Research Foundation matters. Education Minister (Higher Education and Skills) Ong Ye Kung will oversee the whole Education Ministry. Mrs Josephine Teo moves up from Second Manpower Minister to Manpower Minister. Others enter fresh roles, and will be exposed to new policy issues, new stakeholders and new strategic calculations. Labour chief Chan Chun Sing will be Trade and Industry Minister. He also takes charge of the public service. Mr S. Iswaran moves from the Trade and Industry Ministry to the Communications and Information Ministry. Education Minister (Schools) Ng Chee Meng will be labour chief. Ms Indranee Rajah becomes full minister and will be Second Minister for Finance and Education. That means there will be three women full ministers, a record number for Singapore. As the 4G leaders are stretched, some will prove more adept at mastering their new briefs. Each minister's strengths and weaknesses will become more apparent, even as he or she learns to work as part of a team. New roles also force ministers to take a different perspective in Cabinet discussions and will hopefully help them gain a more holistic appreciation of governing. Like a good football team from the English Premier League, the Cabinet also needs its depth of talent to extend beyond the first team into its substitutes, if it is to succeed not just in one match but over the entire season. PM Lee has continued to develop talent below the full minister level. Notably, four backbenchers were brought in as new office-holders. All four - Mr Edwin Tong, Mr Zaqy Mohamad, Ms Sun Xueling and Dr Tan Wu Meng - are from the private sector. They can contribute to the diversity of views and experience in the 4G team, whose heavyweights come mainly from the public sector. Mr Zaqy's entrance as Minister of State makes up for the loss of another office-holder who is Malay - Dr Yaacob Ibrahim, who retires from the Cabinet. The number of office-holders who are Malay remains at four, after counting Environment and Water Resources Minister Masagos Zulkifli, Senior Minister of State Maliki Osman and Senior Parliamentary Secretary Amrin Amin. But the number of full ministers from the community goes down from two to one, and some will hope this can be remedied in time to come. One question that has been on the minds of many Singaporeans remains unanswered: Who will be the next prime minister? The three front runners - Mr Heng, Mr Chan and Mr Ong - have all been given larger roles, with no candidate pulling ahead. Some have said this transition bears resemblance to the passing of the baton from Mr Lee Kuan Yew to Mr Goh Chok Tong. A key similarity: There was more than one strong candidate for the top job, whereas in the case of Mr Lee Hsien Loong's generation, he did not have a clear competitor. It may thus be useful to look at the parallel moment - when Mr Goh and his peers first dominated Cabinet to a similar extent. That happened around the time of the 1984 election. Four ministers - Dr Goh Keng Swee, Mr Ong Pang Boon, Mr Howe Yoon Chong and Mr Chua Sian Chin - retired. The share of 2G ministers rose from under half to nearly 60 per cent. When that happened, the 2G ministers also chose Mr Goh to lead them. He was appointed first deputy prime minister, running the Government day-to-day. That the 4G ministers have not picked a leader is perhaps due to their relative lack of experience. Mr Goh was in politics for close to nine years by the time he became heir apparent. The 4G front runners entered politics about seven years ago. But the decision cannot be postponed indefinitely, as PM Lee has said he wants to step down by the time he is 70, in 2022. In any case, the identity of the next prime minister should be known by the next election, due by April 2021. PM Lee said in January that the new man will have to "pull his weight" at the next election, and "show that he deserves to be what his peers and his colleagues in Cabinet think that he can do". "This is necessary. If you're unable to win elections, you cannot be the leader," he added. In keeping with recent practice of there being a Cabinet reshuffle roughly once a year, there will perhaps be a clearer sense of the next prime minister by the next reshuffle. After 27 years in government - 14 of them helming the Ministry of Trade and Industry, Mr Lim Hng Kiang would be taking a break from trade data. "My sons are planning a safari trip," the famously reticent minister shared in a recent interview, when asked about his post-retirement plans. But he may not be able to stay away from Singapore for too long: Mr Lim, 64, will continue in the ministry as special adviser, assisting his successor Chan Chun Sing, announced the Prime Minister's Office yesterday. 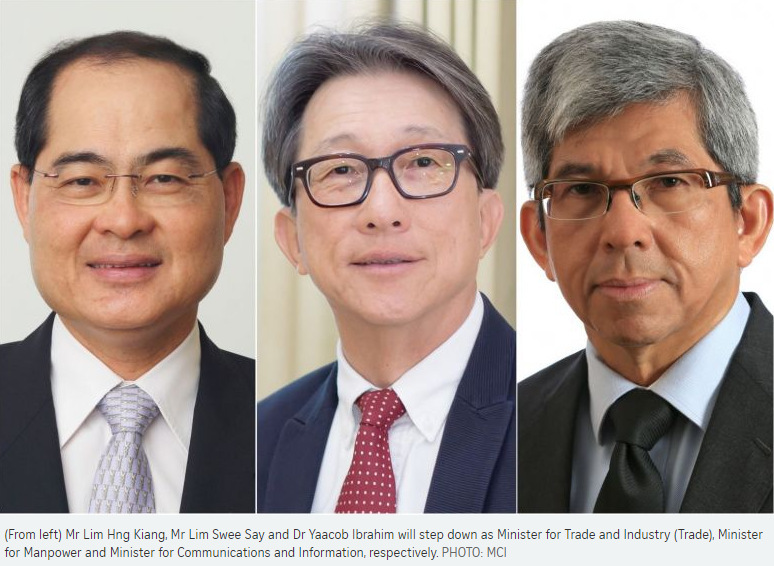 Mr Lim, along with Manpower Minister Lim Swee Say, 63, and Minister for Communications and Information Yaacob Ibrahim, 62, are the three veteran ministers who will leave the Cabinet on May 1, making way for younger leaders. All three remain as MPs. Dr Yaacob is an MP for Jalan Besar GRC, Mr Lim Hng Kiang is an MP for West Coast GRC and Mr Lim Swee Say is an MP for East Coast GRC. It is not yet clear if they will contest in the next general election - which must be held by April 2021. In an interview, Dr Yaacob said he has to consider his options if he is asked to contest. "If (the Prime Minister) doesn't have enough people, there's a vacuum, I have to balance that against my other needs. I'm not getting younger, you know." He added that as a member of the Muslim community, he intends to find a way to contribute to Muslim affairs without being "in the way" of the new minister. Mr Lim Hng Kiang said: "My approach is always, I believe in renewal. The earlier generation made way for the third generation and, similarly, it's my firm belief the third generation of leaders should make way for the fourth generation." Asked what his plans are, Mr Lim Swee Say said his immediate priority after May 1 is to spend more time with his family and residents in East Coast GRC. "It has been a privilege for me to serve in the Cabinet for the past 18 years since being appointed acting minister for the environment in 2000," he said. "I will leave the Ministry of Manpower in the good hands of Josephine. She is a bright, capable and passionate 4G leader whom I have tremendous confidence in." When they retire, Mr Lim Hng Kiang would have held his post at the Ministry of Trade and Industry for 14 years, while Dr Yaacob would have been the Minister-in-charge of Muslim Affairs for 15 years. Mr Lim Swee Say, who was the labour chief for eight years, has been Manpower Minister since 2015. Of the three, Mr Lim Hng Kiang has been in politics the longest. He entered politics 27 years ago in 1991 when he contested in Tanjong Pagar GRC. The political careers of Dr Yaacob and Mr Lim Swee Say span 22 years, from the time they contested in the 1997 General Election. 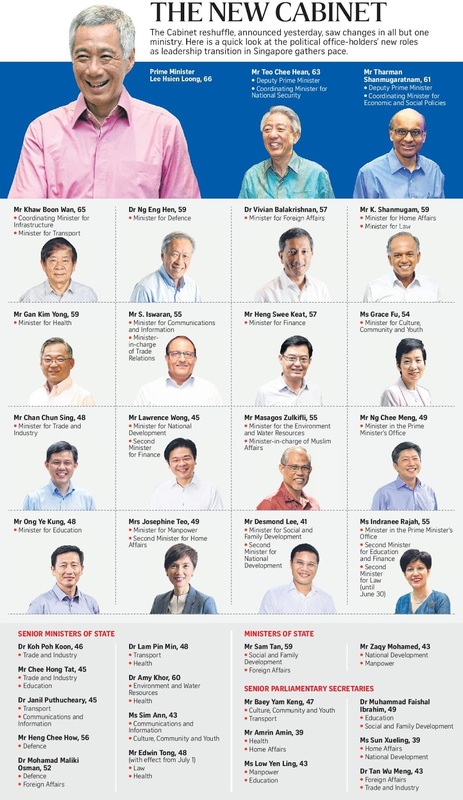 Dr Yaacob won in Jalan Besar GRC and Mr Lim in Tanjong Pagar GRC. Prime Minister Lee Hsien Loong thanked the three men "for their services and contributions, in multiple portfolios over many years", said a statement from his office. The Cabinet reshuffle achieves a good balance of having older, experienced ministers still in charge of the heavyweight portfolios, and exposing younger leaders to new areas, said political observers. They noted that more strategically important and politically sensitive ministries such as Defence, Transport, Home Affairs and Health remain in the hands of older ministers. And while younger leaders will helm portfolios like Trade and Industry and Manpower, there are still senior ministers in coordinating roles to guide them. "The younger ministers can count on the collective wisdom of the more senior ministers, at least in the short term, before eventually taking over completely the governing of Singapore in the medium to longer term," said ISEAS - Yusof Ishak Institute analyst Mustafa Izzuddin. Many interviewed said the reshuffle is a clear signal that Prime Minister Lee Hsien Loong wants to give the younger leaders a chance to prove their mettle. "There is a saying that if you want to see the true colours of a tea bag, you have to put it in hot water. The reshuffle will allow us to see how the young leaders cope with bigger responsibilities. They are very smart, and now the question is whether they can tolerate the heat," said Nominated MP (NMP) Azmoon Ahmad. Mr Thomas Chua, the managing director of Teckwah Industrial and also an NMP, added that with various 4G leaders getting new roles, there is now a lot of expectation, not just over how well they carry them out, but also over how well they can engage the public. Several observers and Singaporeans interviewed welcomed the diversity boost from the promotion of Ms Indranee Rajah to full Minister in the Prime Minister's Office. Law graduate Teo Shao Wei said it signalled to him that Mr Lee is "looking to build a more diverse and inclusive Cabinet". With Ms Indranee's promotion, there are now three women in the Cabinet. The other two are Ms Grace Fu and Mrs Josephine Teo. Holland-Bukit Timah GRC MP Liang Eng Hwa said the reshuffle also shows that there is "very solid bench strength in the Cabinet". Singapore Business Federation chairman Teo Siong Seng described the reshuffle as timely for the business community. He noted that the external environment is still uncertain, with some countries threatening trade wars. But, he said, "business confidence in Singapore has actually been on the rise in the last three quarters and the business environment in Asia and Asean is also not bad, so it's a good time for a leadership change". Mr Zainal Sapari, an MP for Pasir Ris-Punggol GRC, said he was surprised to find out that the labour movement will have another senior minister of state - Dr Koh Poh Koon - joining it. Others were disappointed to hear that senior leaders like Manpower Minister Lim Swee Say and Communications and Information Minister Yaacob Ibrahim were retiring. NMP Ganesh Rajaram, a media executive, said he had worked closely with Dr Yaacob for six years as a Media Development Authority board member. "I always found him to be the consummate leader - very humble and willing to listen." As to who Singapore's next prime minister will be, some had hoped the reshuffle would give better clues. Observers were mixed on this point, with many saying the field still looks open to the three leading contenders - Mr Chan Chun Sing, who has been appointed to lead the Ministry of Trade and Industry (MTI), Mr Ong Ye Kung, who has been named sole Education Minister, and Finance Minister Heng Swee Keat, who has been given additional responsibilities in the National Research Foundation. Political observer Derek da Cunha said: "I don't think one can draw too much political significance from this reshuffle, except that it gives certain personalities more experience in handling a different portfolio." Dr Gillian Koh, deputy director of research at the Institute of Policy Studies, felt the reshuffle signalled that Mr Chan and Mr Heng now have an edge over Mr Ong. She said it is critical for any prime minister to helm MTI or the Finance Ministry, for "the helicopter view it gives of the Singapore economy and the exposure to international economic issues, especially now with trade protectionism rearing its ugly head around the world". Still, she said, there was scope for Mr Ong - and other 4G leaders - to step up to more heavyweight roles as more 3G leaders retire in time to come. She noted that with this reshuffle, Deputy Prime Minister Teo Chee Hean is handing over his oversight of the National Research Foundation to Mr Heng, and his oversight of the Public Service Division to Mr Chan. "We shall have to see who else he hands over his other work to... and with the eventual standing down of the two deputy prime ministers later, who will take over," she said. The promotion of four backbenchers with private-sector experience to office-holders will help blunt a common criticism that the political line-up in government is dominated by former civil servants and military men, said political analysts. But they also noted that these newcomers will not significantly change the complexion of the front bench as they are entering at relatively junior levels. The four MPs are senior counsel Edwin Tong, Ernst and Young partner Zaqy Mohamad, Business China chief executive Sun Xueling and oncologist Tan Wu Meng. Comparative politics researcher Felix Tan, of private tertiary institution SIM Global Education, also made the observation that few advance to be full ministers. The lack of full ministers with private-sector experience could be because running a ministry is "familiar territory" for those who have served in the military or worked in government ministries, he added. Out of the 36 office-holders, around 17 would have had private-sector experience when Mr Tong joins their ranks on July 1. The other three will take up their positions on May 1. Currently, the corresponding figures are around 14 out of 35. Analysts interviewed said that the move to bring in more office-holders with private-sector experience is a good sign, reflecting greater diversity. National University of Singapore political scientist Bilveer Singh believes the increase could start a trend, noting that the private sector is a far more competitive world than the public service. The promotions show the Government is also willing to take a chance on long-serving private-sector MPs, he said, citing Law and Home Affairs Minister K. Shanmugam. Mr Shanmugam, a former senior counsel, was a backbencher for 20 years before he was promoted to be a full minister immediately in 2008. Other Cabinet ministers with private-sector experience include Health Minister Gan Kim Yong, Culture, Community and Youth Minister Grace Fu and Minister for the Environment and Water Resources Masagos Zulkifli. Another is incoming Minister in the Prime Minister's Office Indranee Rajah. The four newcomers will join the line-up comprising senior ministers of state, ministers of state, senior parliamentary secretaries and parliamentary secretaries. Mr Tong will be Senior Minister of State for Law and Health, Mr Zaqy will be Minister of State for National Development and Manpower, Ms Sun will be Senior Parliamentary Secretary for Home Affairs and National Development and Dr Tan will be Senior Parliamentary Secretary for Foreign Affairs as well as Trade and Industry. Attracting capable leaders from the private sector has always been a challenging task for the Government, said Singapore Management University law don Eugene Tan. Besides possible pay cuts, office-holders face a loss of privacy, a risk of being defeated in an election, and the opportunity cost of giving up their private careers, he said. Prime Minister Lee Hsien Loong said in a 2012 speech on ministerial pay that he wished he could find more private-sector people who are "willing to leap into what for them must be an uncertain new path". Promotions to the front bench typically hinge on several factors, including the MPs' performance in Parliament and whether their private-sector skills can add to their assigned office. Their political appeal among their constituents is also critical. "The reality of an office-holder losing his or her seat is very real today," said Dr Eugene Tan. Mr Tong told The Straits Times it was "not easy" to leave his legal career that spans almost 25 years for a position that is likely to pay less and will come under tremendous public scrutiny. But after discussing the move with his wife and three teenage daughters in the past one year, he decided to take the plunge: "PM explained his vision and plans for improving Singapore, and I thought it would be a good challenge for me if I could put some of the ideas into motion." Mr Zaqy said his 19 years in the private sector could prove useful in his new roles, particularly in handling construction and real estate agent issues as well as workplace safety and low-wage workers. "Many of the policies need greater engagement with stakeholders. I hope my understanding of how corporates or businessmen think or the challenges affecting Singaporeans would improve that dialogue," he said. When changes to the Cabinet kick in on May 1, three women will be full ministers, the largest number ever. Senior Minister of State for Finance and Law Indranee Rajah, 55, has been promoted to become Minister in the Prime Minister's Office, as part of the Cabinet reshuffle announced yesterday. She will join Minister for Culture, Community and Youth Grace Fu and incoming Manpower Minister Josephine Teo in the Cabinet. Yesterday, Ms Indranee told The Straits Times she is "honoured and humbled" by the new appointment. It sends a signal that "as a government, we recognise women in leadership", she said. "I hope my appointment will be a source of encouragement to women in Singapore." Ms Indranee will also be Second Minister for Education and Finance. As a transition arrangement, she will also be Second Minister for Law until June 30, before senior lawyer Edwin Tong becomes Senior Minister of State for Law from July 1. Observers like sociologist Paulin Straughan cheered the bigger presence of women in the Cabinet. "They have all served in politics for a long time, and proven themselves capable of doing the job of minister." Ms Indranee's promotion is the latest progress for women in the last few years: Ms Fu was made full minister in 2015, and Mrs Teo last year. On whether the pace of getting women into the Cabinet is too slow, Prof Straughan thinks there are now more opportunities for women to progress to the top. She said: "Whether they choose to then take up that opportunity should be their personal choice, given that some may want to attend to other responsibilities like family." Ms Indranee is no stranger to the education sector. She was Senior Minister of State for Education from 2012 to 2015. She also led the Applied Study in Polytechnics and ITE Review (Aspire) committee, launched to improve the career and academic prospects of polytechnic and Institute of Technical Education graduates. Its recommendations later culminated in the SkillsFuture movement to encourage lifelong learning and aligning education with economic demand. Professor Cheong Hee Kiat, president of the Singapore University of Social Sciences, had worked with Ms Indranee as a member of the Aspire committee. "She is very thoughtful and understands different points of view," he said, adding that he looks forward to seeing bold moves in the education sector under Education Minister Ong Ye Kung's and Ms Indranee's leadership. "They are not ones who shy away from making difficult decisions and they will move forward on their decisions if they are necessary," he said. Education Minister (Schools) Ng Chee Meng looks set to be the next labour chief, after an announcement on Monday (April 23) that he will be joining the National Trades Union Congress (NTUC) full time next month. In a letter to NTUC president Mary Liew, Prime Minister Lee Hsien Loong said he has asked current NTUC chief Chan Chun Sing to return to the Government. He also acceded to an NTUC request to release Mr Ng to serve the unions. Mr Ng was named NTUC deputy secretary-general on Monday. He will serve on a part-time basis for now and full time from May 1. In a letter to Mr Lee dated April 16, Ms Liew also asked for another office-holder to act as a liaison between NTUC and government agencies in the execution of the Industry Transformation Maps (ITMs). These are blueprints for various economic sectors to upgrade through worker training, innovation and productivity improvement. In his reply to her on Tuesday, Mr Lee said he has asked Senior Minister of State for Trade and Industry Koh Poh Koon to step into this role, serving NTUC part-time while retaining ministry appointments. Dr Koh also became deputy secretary-general of NTUC on Monday. In his letter, Mr Lee said he fully agreed with Ms Liew that the symbiotic relationship between NTUC and the People's Action Party had served Singapore well since independence, adding that "we should continue to strengthen both the leadership of the labour movement and this relationship". Enhancing the training and skills of workers while expanding the labour movement's outreach to new groups of workers are key priorities going forward, he added. Speaking to the media on Tuesday, Mr Ng declined to say whether he would take over as secretary-general soon. But he later told The Straits Times: "I am always ready (to step up as secretary-general), when the moment arrives." He said the new role is a natural continuation of his work as Education Minister: "In MOE, I am happily educating and nurturing our young for the future. In the labour movement, it's really an extension of that mission, making the lives of our workers better through lifelong learning (to prepare for) current realities, as well as... for the future." It is not yet clear who will take over Mr Ng's role at the Ministry of Education (MOE). Mr Lee said on Tuesday that he will announce the Cabinet reshuffle today or tomorrow. While Mr Ng has not worked in NTUC before this, he has, as Second Transport Minister, been interacting with union leaders and workers in the aviation, transport and taxi industries. He just returned from a retreat with the National Transport Workers' Union, he noted. The workers shared with him anxieties over disruptions in their sector. He encouraged them to see the disruptions as opportunities "for a well-placed country like ours to launch into new possibilities". Of his new role, Dr Koh said his work on ITMs made him aware of the need to spread the transformation message to workers on the ground. So when the opportunity came to serve in NTUC, he saw it as a good way to contribute, he added. In a Facebook post last night, Mr Chan welcomed the pair to NTUC. "We will benefit greatly from Chee Meng's experience in MOE and the various leadership roles he has assumed in his career." He added: "Poh Koon, on the other hand, with his experience in MTI, will be an asset in the areas of training and helping to operationalise the ITMs across our labour movement stakeholders." Veteran unionist K. Karthikeyan said Mr Ng will need time to win the broad support of workers. "It's a good move to introduce him as deputy secretary-general before he takes on the full role of labour chief, so that the people accept him when he takes on that leadership role. Given his enthusiasm, I think he can learn fast," he said. The NTUC said in a statement that its central committee had met in the afternoon and unanimously elected Mr Ng to take the helm after accepting the resignation of Mr Chan. This completes the leadership handover at the NTUC, which has been widely expected since Mr Ng, together with Senior Minister of State for Trade and Industry Koh Poh Koon, were co-opted into the labour movement as deputy secretaries-general on April 23. Mr Ng, who is now Minister in the Prime Minister's Office, relinquished his roles as Education Minister (Schools) and Second Minister for Transport on May 1. In a Facebook post yesterday, he thanked Mr Chan for his work at NTUC, promising to build on the strong foundation to strengthen the labour movement. He first joined NTUC as deputy secretary-general in January 2015, and was promoted to secretary-general in May, taking over from outgoing labour chief Lim Swee Say in four months. During his three years with the labour movement, Mr Chan had expanded its reach to include more members from groups such as professionals, managers, executives, freelancers and migrant workers. He also encouraged workers to take up training courses and led efforts to raise additional funds for NTUC's Education and Training Fund in 2016. In his resignation letter, released by NTUC to the media, he told NTUC president Mary Liew that while he may be officially stepping down as labour chief, the labour movement will always have in him "a friend, a partner and a supporter". He added that his portfolio at the Ministry of Trade and Industry is an extension of NTUC's work - ensuring that Singapore's workers can continue to benefit from good jobs, and businesses will have the opportunities to become more competitive. He also acknowledged the fears, concerns and aspirations of workers in an age of increasingly volatile economic headwinds, and unforeseen disruption to businesses and jobs, saying: "Our aim is not just to protect jobs, but more importantly, to protect our working people." Mr Chan promised that he would work together with the NTUC in his new capacity, to "write the next chapter of our country's economic development, together". Ms Liew, in a valedictory letter to Mr Chan, credited him with "disrupting" the labour movement, by turning it into one that is more representative and relevant to Singapore's workers. "Your perseverance and tireless efforts to strengthen the labour movement was evident to all," she said, noting that he had been voted into the central committee at his first union elections in October 2015, less than a year after he joined. While the NTUC central committee can appoint a new secretary-general at any time, the secretary-general is expected to stand in the next union election to be elected into the committee to keep his position. Union elections are held every four years, with the next one taking place some time next year. Union leaders vote by secret ballot for the 21 members of the central committee, who then decide among themselves who will be the secretary-general. Prime Minister Lee Hsien Loong has sent valedictory letters to three retiring ministers, Mr Lim Hng Kiang, Mr Lim Swee Say and Dr Yaacob Ibrahim, lauding them for their contributions to Singapore over decades of service. Among the third-generation ministers, he has known Mr Lim Hng Kiang, 64, for the longest time - since they were students at Cambridge University, the Prime Minister noted. In the letter to the outgoing Minister for Trade and Industry (Trade), Mr Lee described Mr Lim Hng Kiang's approach to work as "hard-headed and practical, yet infused with a human touch". "You are steady under pressure, analyse problems rationally and objectively, and have a sensitive feel for political considerations," Mr Lee wrote to the man who is leaving the Ministry of Trade and Industry (MTI) after 14 years at the helm. He added: "I and my colleagues will miss your pragmatic, far-sighted approach to issues and your wise counsel in Cabinet." As MTI chief, Mr Lim Hng Kiang built up key industry clusters in manufacturing, including petrochemicals, semiconductors and life sciences, Mr Lee noted. 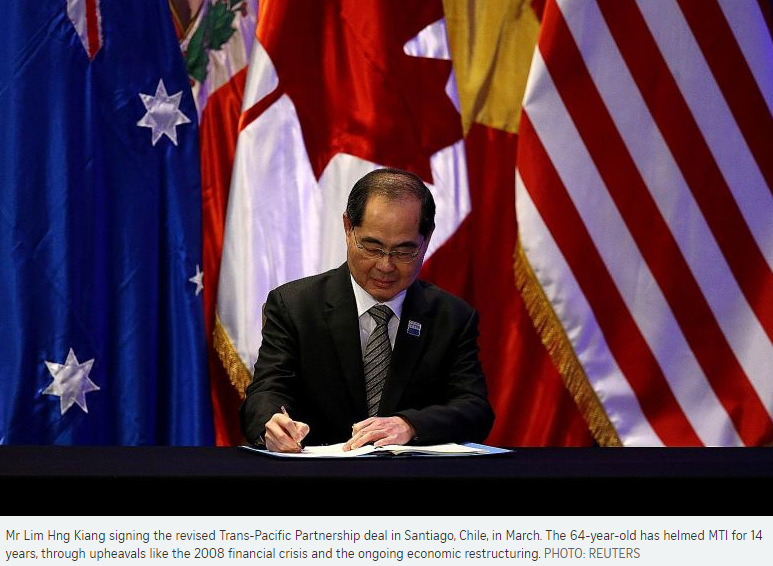 He and his team also negotiated an extensive network of free-trade and partnership agreements for Singapore. When the financial crisis hit in 2008, "your calmness and experience were pillars of strength", Mr Lee wrote. In his letter to Mr Lim Swee Say, 63, Mr Lee recalled how the outgoing Manpower Minister struck him as a "determined, passionate leader who delivered results". He wrote: "You had a warm, down-to-earth personality. On the ground, you were practical, persuasive and effective." Among Mr Lim Swee Say's career highlights, Mr Lee pointed to the introduction of Newater, where the challenge "was not the science or engineering", but how to persuade Singaporeans to accept the idea of recycling and consuming used water. "This you achieved brilliantly," he wrote to Mr Lim Swee Say, who was then Environment Minister, saying people's acceptance of Newater has helped Singapore "substantially overcome a strategic vulnerability that has obsessed us ever since independence". Mr Lee noted that as Manpower Minister, Mr Lim Swee Say had a strong understanding of the labour market and how to balance the interests of workers with the needs of businesses. 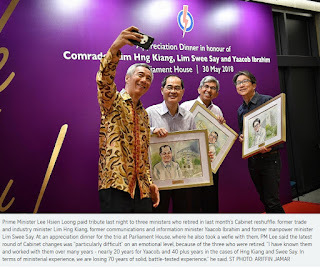 He praised Mr Lim Swee Say's ability to coin vivid catchphrases that have clung to Singapore's collective memory, such as "cheaper, better, faster" and "1/3 + 2/3 > 1" to describe the workforce composition of one-third foreigners and two-thirds locals. 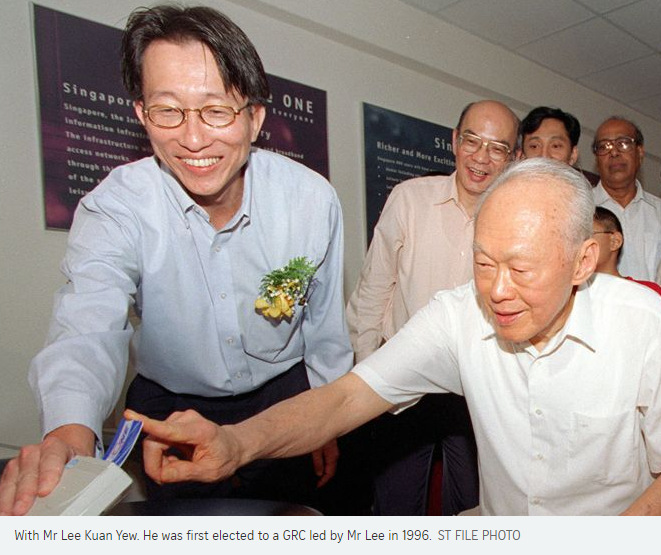 "These were not idle wordplay or poor math, but embodied important economic and manpower realities and priorities in a form that Singaporeans could understand, remember and act upon," Mr Lee said. In his letter to Dr Yaacob, 62, he highlighted the important role the outgoing Minister-in-charge of Muslim Affairs has played in helping the Government handle sensitive issues involving race and religion. "I could rely on you to understand the national imperatives, present forthrightly the Malay/Muslim point of view and advise me candidly on how best to move forward with the support of the community," Mr Lee said. He also recalled Dr Yaacob saying, in one of his first parliamentary speeches as Acting Minister, that "one can be a good Muslim and a good citizen". "This set an important direction for Singapore Muslims," Mr Lee wrote. "You have worked hard to lead the community to look forward, to integrate with non-Muslim Singaporeans, and to adapt and change with the times." Dr Yaacob,the outgoing Communications and Information Minister as well, also pushed for investment in infrastructure, so that Singapore today has one of the highest broadband speeds and Internet penetration rates in the world, while ensuring no one was left behind by the new technology. The trio, who collectively have 66 years on the front bench, will retire from the Cabinet on Monday. Their retirement, part of a wider Cabinet reshuffle, will see more fourth-generation leaders take the lead in key government roles. In a Facebook post yesterday, Mr Lee said all three have been invaluable members of his team, and will be deeply missed. "But I have to let them go, so as to renew the leadership team for Singapore." Mr Lim Hng Kiang, the minister in charge of the trade portfolio, is a man of few words, a trait probably developed after a controversial remark he made in Parliament in 2001. Mr Lim, who was then Health Minister, was asked by MP Lily Neo if more could be done to make it easier for women to go for breast cancer screening. While sympathising with women who want screening, he also said: "Save on one hairdo and use the money for breast cancer screening." Outraged women chided him in a flurry of letters to The Straits Times Forum page. He explained his intent was to get across the message that health is a personal responsibility, but it did not placate everyone. Perhaps the memory of that episode 17 years ago still lingers on because when asked how he communicates economic policies to the grassroots, Mr Lim, 64, says wryly: "I'm not a good communicator, as you know by now." To get around it, he turns to Cabinet colleagues and MPs with better communication skills, he says in a farewell interview before he is to retire from the Cabinet on Monday. "We share among ourselves arguments or examples that we believe will resonate and we use them." He adds: "They don't look to me to come up with a better communications plan." What they evidently count on him to do is steer the economy through the vagaries of financial markets and economic cycles. Mr Lim has helmed the Ministry of Trade and Industry (MTI) for a record-breaking 14 years - a solid indicator of the extent to which Prime Minister Lee Hsien Loong has valued his steady stewardship of the economy through upheavals like the 2008 financial crisis and the ongoing restructuring of the economy. His accomplishment in holding a single, relatively significant portfolio for so long is outmatched by two others in the current 13th Parliament. 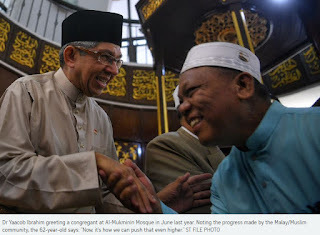 They are: Dr Yaacob Ibrahim, who has been Minister-in-charge of Muslim Affairs for 15 years, and PM Lee, who was deputy prime minister for 14 years and has been Prime Minister for another 14. Even after leaving the Cabinet, Mr Lim will be special adviser at MTI, giving counsel to new Trade and Industry Minister Chan Chun Sing. Mr Lim, however, played down the achievement, saying: "Well, I think that is the PM's prerogative. If he found my ideas stale, he would have had to rotate me." Like most of his Cabinet colleagues, he was rotated among various ministries, including Foreign Affairs, Finance and Health as well as the Prime Minister's Office. He was promoted to full minister in 1995 and took charge of MTI in 2004. His tenure coincided with a period of rapid growth for Singapore, interrupted only by the 2008 financial crisis. The Government also laid the groundwork to restructure the economy to boost productivity and innovation, in preparation for a more competitive future. On the highs and lows in his 27-year political career, Mr Lim is typically reticent and shows visible discomfort whenever questions border on the personal. "There are many things which I'm very happy with, and several which I'm disappointed with," he said, declining to elaborate. What were some things he felt he could have done better? He says, with a laugh: "It's not going to change anything, so let's just leave it at that." Asked what he plans to do with his free time, he says: "We'll cross that bridge when we come to it." Later, he adds that his grassroots volunteers in Telok Blangah ward in West Coast GRC look forward to spending more time with him. While he is loath to talk about himself, Mr Lim is most at ease when defending Singapore's economic growth model and policies. Critics like Dr Linda Lim, University of Michigan professor emerita of corporate strategy and international business, has called for a review of Singapore's economic model. The "state-directed, export-oriented, manufacturing-focused, multinational-led" growth model has run its course, owing to changing geopolitics, technological changes and the rising cost of doing business in Singapore, she argues. Mr Lim counters that Singapore is "constantly tweaking" its economic strategy, and the results of its growth model speak for itself. "Today, we are a $400 billion economy... If you look at the world rankings, we are somewhere like 38th in the world. "In terms of population, we are probably 115th. So in terms of size of economy versus population, I think we've done fairly well." But there have been some misses, he says. For example, Singapore's ambition to be a medical tourism and regional education hub had to take a back seat to the more pressing needs of the local population. "The general assessment is that for a country of our size and resource base, it's quite remarkable that we are able to sustain manufacturing at 20 per cent." This has been possible not just by relying on indigenous capabilities, but also by incorporating foreign capabilities, he says. "That strategy is still very sound." Few would dispute Mr Lim's contributions to that strategy. March 2003: Singapore is hit by deadly Sars outbreak. Mr Lim leaves Health Ministry to be Minister in the Prime Minister's Office in August. October 2008: Financial crisis, triggered by collapse of US investment bank Lehman Brothers, spreads across the world. Mr Lim reassures Singaporeans that the likelihood of a bank going bust in Singapore is small. October 2015: Trade and Industry Ministry is split between Mr Lim, who takes the trade portfolio, and Mr S. Iswaran, a fourth-generation leader, who heads industry. There were no such words as "betterer", "betterest" or "futurise" in local politics, until former labour chief Lim Swee Say came along. The veteran minister also coined snappy slogans such as "cheaper, better, faster" and "upturn the downturn" in his speeches, sometimes drawing ridicule and criticism. The 63-year-old acknowledges that the non-standard English expressions can rub some people up the wrong way. "Some will like it, while others may hate it. To me, I can only do it in the way that I know best," he tells The Straits Times in an e-mail interview on the good, the bad and the ugly in his 21-year political career, which will enter a new phase after Monday when he retires as Manpower Minister from the Cabinet. "My purpose is to convey serious messages in a light-hearted way so that people will hopefully remember them longer, and understand them better," he says. "These are not hollow slogans and sound bites, but a distillation of what I've learnt through 40 years of working with technology, interacting with global corporations and from my close and personal engagement with union leaders and workers on the ground," he adds. Besides the catchphrases, Mr Lim is also known for championing the interests of low-wage workers, a cause close to his heart. In 2003, as the Minister for the Environment, he began a job redesign for hawker centre cleaners to boost productivity and raise their pay. Subsequently, as Second Minister for National Development, he repeated the move for workers in the landscaping sector. The experiences inspired him in June 2012, when he was secretary-general of the National Trades Union Congress (NTUC), to announce a "progressive wage model" to raise the monthly pay of all local cleaners to above $1,000. The progressive wage model is a wage ladder that pegs wage increases to workers' training. Since then, the NTUC has rolled out wage ladders for the cleaning, security and landscaping sectors to boost the salaries of their low-wage workers. Like many past and present ministers, Mr Lim's career trajectory took the familiar route. Before he entered politics in December 1996, the Singapore Armed Forces Overseas Scholarship holder was a public servant who held senior positions at the National Computer Board and the Economic Development Board. 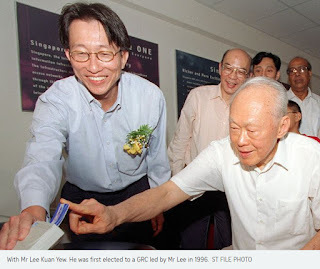 He joined the NTUC in July 1996 as a prelude to entering politics and, about five months later, stood for the general election as a member of the Tanjong Pagar GRC team led by then Senior Minister Lee Kuan Yew. After about two years as a junior minister, he became a full minister in 2001 at age 47, and in 2007, he was appointed the labour chief. He stayed there the longest, until he passed the baton to Mr Chan Chun Sing in 2015. The long stint is the reason for his strong association with workers, whose welfare he believes is best served by ensuring that they have a job. This belief inspired him to produce one of his most satisfying achievements: the Skills Redevelopment Programme in 1996 and 1997. "I raised $10 million to start it," he says, adding: "Step by step, it was elevated from a $10 million pilot project to a $50 million, $100 million national programme." The programme has two novel features: Workers get their skills certified and employers receive subsidies when their workers go for training. The programme laid the foundation for SkillsFuture today, says Mr Lim, referring to the national movement to upgrade the skills of Singaporeans. While he is proud of the three-way partnership of the Government, unions and employers, a unique emblem of trade unionism in Singapore, he acknowledges that it is uneven in some sectors and firms. In the past three years as the Manpower Minister, Mr Lim has been criticised for not doing more to help local workers, such as the ministry resisting repeated public calls to put a cap on the number of professionals holding the Employment Pass that companies can hire. Mr Lim argued that the challenge is to find the "fine balance" between being pro-business and pro-worker - a situation that is dynamic. Other than his non-standard English words, Mr Lim displays a soft side not commonly seen among politicians. He has teared up on several occasions, including at last year's Budget debate when he talked about the resilience of some local workers in the face of joblessness. Asked why he cried, he says: "We are all humans, and I have 'sweet spots' and 'soft spots' just like everyone. "After more than 20 years in politics, I am glad my heart is still soft and warm." July 1996: Mr Lim Swee Say quits the elite Administrative Service and Economic Development Board, where he was managing director, to join the National Trades Union Congress (NTUC). Dec 1996: Elected unopposed at Tanjong Pagar GRC. 1997 to 1999: Deputy secretary-general of NTUC. June 1999 to Sept 2000: Minister of State for Trade and Industry. June 1999 to Nov 2001: Minister of State for Communications and Information Technology. Oct 2000 to Aug 2004: Acting Minister for the Environment and promoted to full Minister in November 2001. Dec 2003: Cries when Singapore's women's badminton team win a gold at the SEA Games in Vietnam, when Mr Lim is president of the Singapore Badminton Association. Aug 2004: Minister in the Prime Minister's Office and Second Minister for National Development. He is concurrently NTUC deputy secretary-general. Sept 2005: Relinquishes portfolio of Second Minister for National Development to serve full time in the NTUC. Nov 2007: Uses the words "better, betterer and betterest" at launch of Speak Mandarin campaign, referring to how his command of English has improved over the years. May 2015: Minister for Manpower. August 2015: Announces that the Manpower Ministry has put 38 companies on its watchlist for hiring too many foreigners and not doing enough to groom Singaporeans. When Dr Yaacob Ibrahim became Acting Minister-in-charge of Muslim Affairs in 2002, there were no Malay/Muslims in the Government's elite Administrative Service. The increase is just one of several indicators of progress by the Malay/Muslim community, says the 62-year-old as he prepares to hand over the portfolio to Environment and Water Resources Minister Masagos Zulkifli when he retires from the Cabinet on Monday. Other yardsticks of progress that convince him that the community is en route to realising his vision of a "community of excellence" include the rising number of awards given yearly by self-help group Mendaki, which shows students are doing better in school, and the record $44 million of zakat funds, or tithes, collected last year that reflect the greater wealth in the community. These achievements, however, form the foundation, he says. "Now, it's how we can push that even higher. And that cannot come from a minister. It has to come from the individual," he adds. Dr Yaacob also wants more Malays to take the path not well travelled - like an emerging group of Malay entrepreneurs in the infocomm technology sector at Block 71, a cluster of industrial buildings in Ayer Rajah Crescent that is home to about 700 technology start-ups. "Whether they become the next Google, I do not know. But at least they are there," he says. In his 22 years in politics, Dr Yaacob has been guided by the belief that one must always "find things to do to improve the quality of life around us". It underlies the policies and initiatives that are dearest to him. But things have not always gone according to plan, and Dr Yaacob did not shy away from discussing the blunders made under his watch at the Ministry of Communications and Information and the Ministry of Environment and Water Resources. He recounted three high-profile incidents that he wished "had never happened": the flooding of Orchard Road in 2010, the fire in Singtel's Bukit Panjang Internet exchange that brought down banking and telecommunications services for up to eight days in 2013, and the Syonan Gallery naming saga last year that sparked a public outcry. "Those were moments we could have avoided, but also moments for us to improve ourselves," he says. He likens the Orchard Road flooding to a "black swan" event - a highly improbable event that is not only unpredictable, but carries a massive impact. He says: "Who expected Orchard Road to be flooded? We never thought about it but it did." National water agency PUB has since rolled out anti-flooding measures. The Infocomm Media Development Authority, meanwhile, has imposed new standards on Singtel to plug lapses. On using "Syonan" in the name of a World War II gallery space, he acknowledges the Government could have consulted the older generation who went through the war. The space has been renamed Surviving The Japanese Occupation: War And Its Legacies and Dr Yaacob has publicly apologised for the pain caused. Another major controversy involved two children's books: And Tango Makes Three and The White Swan Express. The books with gay themes were removed by the National Library Board from its children's section and slated for pulping. It led to an intense debate, with some supporting the move and others expressing outrage that the library would censor and pulp books in a seemingly arbitrary fashion. The titles were later moved to the adult section, with some qualifiers so people know the nature of their contents, he says. "If you asked me whether we have learnt from it, we have. Could we have done better? Perhaps," says Dr Yaacob. The library has learnt that some parents may feel uncomfortable with those titles, he says, adding: "I don't think we should be in a state when we don't allow such books." "I don't see these as big regrets, but as part and parcel of the entire learning journey," he says, displaying his characteristic optimism. In picking his major triumphs, he lived up to his reputation as the "digitalisation" minister. Two of his proudest achievements were about digital transformations. One is the $80 million SME Go Digital scheme to help small and medium-sized enterprises transform digitally to stay alive amid technology-driven disruptions. Another is the digital transformation of Mendaki, requiring Malays to apply online for loans or tuition fee subsidies. The complete information lets Mendaki carry out data analytics and find out, say, how fast they are paying back the loan. An avid reader, Dr Yaacob, who holds a PhD in engineering from Stanford, launched a nationwide reading programme called kids-Read in 2004 to help needy four-to eight-year-olds start a lifelong habit of reading. As he leaves the Cabinet, the Jalan Besar GRC MP has a lengthy to-do list. It includes catching up on his reading, learning Arabic and reorganising the stamp collection he started in school. Meanwhile, he says with a bright smile: "It has been a wonderful journey. I started out in 1997 and never expected to be a minister." Aug 1997: Dr Yaacob Ibrahim, a senior lecturer at the National University of Singapore's department of industrial and systems engineering, is elected an MP for Jalan Besar GRC. 2004: Launch of nationwide reading programme called kidsRead, to inculcate a lifelong habit of reading in needy four-to eight-year-olds; becomes Minister for the Environment. 2017: Gallery space at the Former Ford Factory renamed after public outcry over use of the word "Syonan"